Rice is highly sensitive to temperature fluctuations. Recently, the frequent occurrence of high temperature stress has heavily influenced rice production. Proper heading date in specific environmental conditions could ensure high grain yield. Rice heading greatly depends on the accurate measurement of environmental changes, particularly in day length and temperature. In contrary to the detailed understanding of the photoperiod pathway, little has been known about how temperature regulates the genetic control of rice heading. Near isogenic lines that were segregated for qHd1, were developed from a cross between indica rice varieties Zhenshan 97 (ZS97) and Milyang 46 (MY46). Using a five sowing-date experiment in the paddy field, we observed the involvement of qHd1 in temperature responses. With the gradual increase of temperature from Trial I to V, heading date of MY46 homozygotes continued to decrease for about 5 d per trial from 76 to 58 d, while that of ZS97 homozygotes was promoted at the same rate from Trial I to III and then stabilized at 69 d. This thermal response was confirmed in a temperature-gradient experiment conducted in the phytotron. It is also found that tolerance of the ZS97 allele to heading acceleration at high temperature was associated with higher grain weight that resulted in higher grain yield. Then, by qRT-PCR and RNA-seq, we found the pathway OsMADS51-Ehd1-RFT1/Hd3a underlying the qHd1-mediated floral response to temperature. By sequence comparison, OsMADS51 for qHd1 displayed a 9.5-kb insertion in the 1st intron of the ZS97 allele compared to the MY46 allele. Furthermore, this large insertion is commonly found in major early-season indica rice varieties, but not in the middle- and late-season ones, which corresponds to the requirement for high-temperature tolerance during the heading and grain-filling stages of early-season rice. Beneficial alleles at qHd1 confer tolerance to high temperatures at the heading and grain-filling stages, playing a significant role in the eco-geographical adaptation of early-season indica rice during modern breeding. 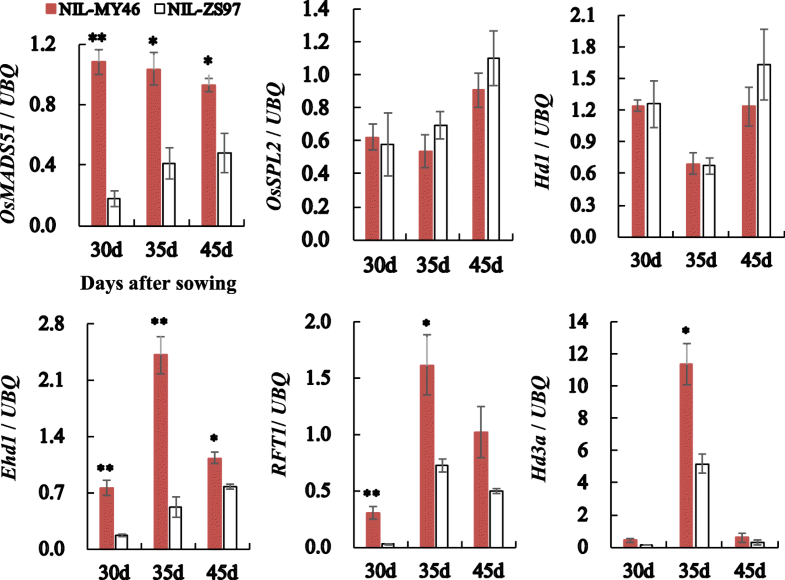 These results, together with the underlying OsMADS51-Ehd1-RFT1/Hd3a floral pathway, provide valuable information for better understanding the molecular mechanism of temperature responsive regulation of heading date and yield traits in rice. In recent decades, the influence of climate changes on rice productivity has become increasingly concerned, such as more frequent high temperature stress accompanied with global warming . A small increase in the daily mean temperature of near 2 °C would make a dramatic decrease in grain yield ; likewise, yield reduction could occur by 1 °C increase in the mean minimum temperature . In rice production and breeding practice, heading date and yield traits are generally considered as key indicators for the response to temperature variation; for instance, early heading and yield loss have been commonly observed at high temperatures. Rice growth process consists of three sequential stages, i.e., vegetative, reproductive, and grain filling . Flower initiation is the indication of transition from vegetative to reproductive stage, which largely determines the heading date variation among different rice genotypes and is governed by thermal sensitivity besides the basic vegetative growth and photoperiod sensitivity [5–7]. Poor seed setting and insufficient grain filling that result in yield loss are typical symptoms at high temperature during the second half of rice growth [8–10]. That is to say, rice is highly sensitive to temperature changes, particularly at the heading and grain-filling stages. To ensure proper seasonal and regional adaptation of rice varieties, heading date has always been a primary target in rice breeding. Clearly, understanding how temperature plays a role in regulating rice heading would be essential to mitigate the impacts of climate changes, particularly when temperature appears to be rising. Unfortunately, neither gene cloning nor quantitative trait locus (QTL) primary mapping in rice has explored the genetic contributions of the thermo-sensitivity to heading date. Gene cloning exclusively focused on the photoperiodic regulation of heading and identified two independent gene pathways [11, 12]. One is the Heading date 1 (Hd1) –Heading date 3a (Hd3a) pathway that is evolutionarily correlated with the Arabidopsis CONSTANS (CO) –FLOWERING LOCUS T (FT) pathway. The other is the Early heading date 1 (Ehd1) –Hd3a/ Rice flowering locus T1 (RFT1) pathway that is unique to rice. QTL primary mapping dealt with various aspects associated with heading date, including basic vegetative phase, photoperiod sensitivity, vegetative growth time, reproductive growth time, and days to maturity (http://archive.gramene.org/qtl/), but thermal sensitivity has not been taken into account. Therefore, it is urgent to identify genetic factors determining the response of rice heading to temperature variations. In Arabidopsis thaliana, studies have revealed the existence of at least some interactions between photoperiod and temperature pathway. For instance, PHYTOCHROME INTERACTING FACTOR 4 could not display the thermal induction of flowering under continuous light, but this function was observed in short-day conditions ; a mutation at EARLY FLOWERING 3 greatly influenced the sensitivity to temperature under abnormal photoperiod pathway . Other genes associated with the response to both photoperiod and temperature changes included photoreceptors such as CRYPTOCHROME 1 , CRYPTOCHROME 2  and PHYTOCHROME B [17, 18]. These findings provide evidences for the importance of thermo-sensitivity in regulating flowering in plants and offer reference to identify relevant molecular contributors in rice. Using near isogenic lines (NILs) and NIL-F2 populations derived from a cross between indica rice varieties Zhenshan 97 (ZS97) and Milyang 46 (MY46), we previously fine-mapped qHd1, a minor-effect QTL for heading date independent of day-length . Surprisingly, the effect of qHd1 was greatly decreased in a following-up test in the winter rice-growing season in Lingshui, Hainan, China. Heading date difference between NILs qHd1ZS97 and qHd1MY46 was only 2.6 d (Additional file 1: Figure S1), much smaller than the difference of 5.3 d observed previously . Therefore, we carried out the present study to investigate the relationship between the function of qHd1 and temperature variation. We firstly conducted a multiple sowing-date experiment in the paddy field to test qHd1, followed by a validation in the controlled environment. Results suggest that qHd1 regulates rice heading in response to temperature, and contributes to high-temperature tolerance at the heading and grain-filling stages. Then, by gene sequencing and expression analysis including RNA-seq, the temperature sensing pathway of OsMADS51-Ehd1-Hd3a/RFT1 was identified, with gene OsMADS51 underlying QTL qHd1. In addition, by genotyping 109 major indica rice varieties released in China since 1950s, evidence was shown for the significance of qHd1 in the adaptation of early-season indica rice to high temperature during rice heading and grain filling. This information would be greatly useful for exploring the molecular mechanism of temperature-related regulation of rice heading in breeding practice. Two sets of NILs and 109 indica rice varieties were used. The two NIL sets were segregated for qHd1, a minor-effect QTL for heading date . They were derived from a BC2F8 plant of the indica rice cross ZS97///ZS97//ZS97/MY46 and named CJ1 and CJ2 (Additional file 2: Figure S2). Each NIL set contained 50 homozygous ZS97 lines and 50 homozygous MY46 lines. The 109 indica rice varieties consisted of three collections (Additional file 3: Table S1). The first collection contained 13 early-season varieties that had large planting areas for a long period before 1985. The second collection included 48 early-season, 24 middle-season and 10 late-season varieties that were planted in large areas for at least one year during 1990−2014 [20, 21]. The third collection had 14 early-season varieties, including Jiayu 253, Zhongxuan 181, and 12 descendants of either Jiayu 253 or Zhongxuan 181, which were released after 2000. The two NIL sets were tested in the paddy field at the China National Rice Research Institute in Hangzhou, China. They were grown from April to October in 2015 with five sowing dates. The sowing and transplanting dates were 28 April and 25 May for Trial I, 8 May and 2 June for Trial II, 20 May and 11 June for Trial III, 15 June and 6 July for Trial IV, and 9 July and 29 July for Trial V, respectively (Table 1). A randomized complete block design with two replications was used. In each replication, each line was grown in a single row of 12 plants, with spacing of 16.7 cm between plants and 26.7 cm between rows. Field management followed the normal agricultural practice. The soil type belongs to purplish clayey soil and irrigation was applied to maintain a proper-watered condition from sowing to harvesting. During the period of floral transition in the rice materials tested, day length in Hangzhou was longer than 13 h (www.timeanddate.com), corresponding to natural long day (NLD) conditions [22–24]. From the weather station located near the experimental field, the data of daily mean temperature were also collected. Heading date (HD) was recorded for all the five trials, and yield traits were measured for Trial I, III and IV. HD was recorded for each plant when a panicle emerged. The data were averaged over all plants of each line in each replication. At maturity, five middle plants of each line were harvested in bulk and sun-dried. Five yield traits were measured, including number of panicles per plant (NP), number of grains per panicle (NGP), 1000-grain weight (TGW, g), spikelet fertility rate (SF, %), and grain yield per plant (GY, g). For measuring TGW, fully filled grains maintaining a constant condition among different samples were used as described previously . To validate the responsiveness of qHd1 to temperature variation, NILs derived from CJ1 and consisted of two homozygous genotypes were grown in phytotrons at humidity of 70% with three different temperature treatments under short day (SD) conditions. The temperature-gradient test consisted of daily cycles of 11 h light at 26, 28 and 30 °C and 13 h dark at 22, 24 and 26 °C, respectively. Two lines were planted for each genotype, with eight plants per line. Heading date was scored for each plant. Penultimate leaves of the two homozygous genotypes of CJ1 were collected at 8:30–9:00 am in 30, 35 and 45 days after sowing with the same sowing date to Trial IV, well covering the transition period from vegetative to reproductive phase. One sample consisted of three leaves and three samples were analyzed for each genotype. According to the manufacturer’s instruction, we used the AxyPrep™ Multisource Total RNA Miniprep Kit (Axygen) to extract total RNA, which was then retro-transcribed by using PrimeScript™ RT Reagent Kit with gDNA Eraser (Takara). Quality and concentration of the RNA extracted was checked with electrophoresis on 1% agarose gel and measured using the Nanodrop ND-2000 spectrophotometer (NanoDrop Technologies, USA). Concentration of the RNA samples used for cDNA synthesis was normalized by dilution with RNase-free ultra pure water. qRT-PCR assays of 20 μL reaction volumes, which contained 0.5 μL of synthesized cDNA, 0.4 μM of gene-specific primers and 10 μL of SYBR® Premix Ex Taq™ (TaKaRa), were conducted by using ABI 7500 Real-time PCR System (Applied Biosystems). Following the manufacturer’s instruction, the qRT-PCR conditions were set up as: denaturing at 95 °C for 30 s, then 40 cycles of 95 °C for 5 s, 55 °C for 30 s and 72 °C for 30 s. To standardize the quantification of gene expression, we used the rice Ubiquitin (UBQ) gene (Os03g0234200, http://rapdb.dna.affrc.go.jp/) as an internal control. The data were analyzed according to the relative quantification method . Primers for qRT-PCR of UBQ, OsMADS51, Ehd1, Hd3a, RFT1, Hd1 and OsSPL2 were listed in Additional file 4: Table S2. Two homozygous genotypes derived from CJ1 were grown in controlled chambers treated with high and low temperature under long day (LD) conditions, which were set as 34 °C, 14-h light / 28 °C, 10-h dark and 26 °C, 14-h light/20 °C, 10-h dark, respectively. Penultimate leaves of the two genotypes were collected in 23 days after sowing (DAS) at high temperature and 44 DAS at low temperature with two biological replicates. In this condition, heading date of the early-heading genotype was 49 d at high temperature and 70 d at low temperature. Based on the understanding that the duration from panicle initiation to heading in early-season indica rice is constantly about 28 d, the 23 DAS for high temperature and 44 DAS at low temperature both correspond to about 26 d before heading, covering the transition period from vegetative to reproductive phase. Total RNA was extracted using the TRIzol reagent (Invitrogen), according to the manufacturer’s protocol. RNA quantification and qualification, library preparation for transcriptome sequencing, clustering and sequencing, data analysis and quality control were conducted by Biomarker (http://www.biomarker.com.cn/) according to their protocol. Differential expression analysis between the two genotypic groups was performed using the DESeq R package (1.10.1) with a model based on the negative binomial distribution. The resulting P values were adjusted for controlling the false discovery rate, using the Benjamini and Hochberg’s approach. 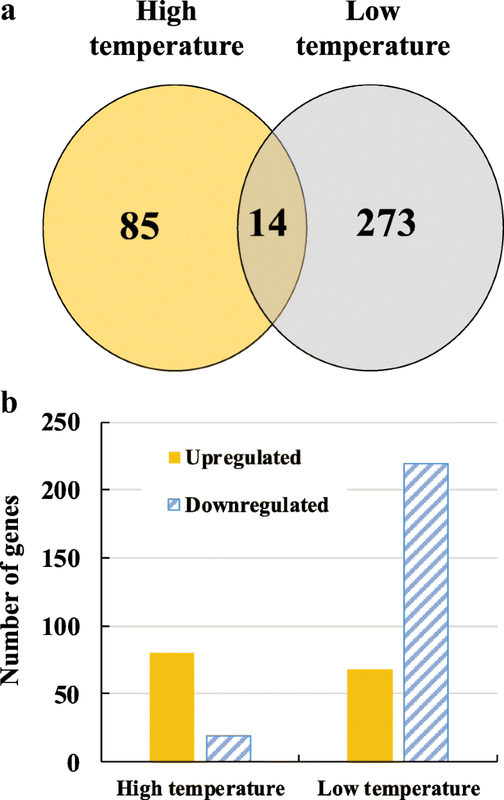 Genes with an adjusted P-value < 0.01 and log2 fold change above or below 1.0 were designated as differentially expressed genes (DEGs). For validation of critical genes identified from the RNA-seq analysis, qRT-PCR was performed by using the same samples for the RNA-seq. For the replicated field trials, phenotypic differences between the two different genotypic groups in each NIL set were evaluated by two-way analysis of variance (ANOVA), which was performed with SAS procedure GLM (SAS Institute Inc. 1999) as described previously . When a significant difference (P < 0.05) was found between the two genotypes, the QTL effects, including additive effect and the proportion of phenotypic variance explained, were estimated with the same data and model. For NIL set that was grown in the controlled chamber, one-way ANOVA was conducted to test the phenotypic differences between the two homozygous genotypic groups. With the sowing date changing at a specific rice cropping area, the available photo-temperature resources and the development progress of a rice variety varied greatly. Five different sowing dates were applied in this study, lasting from early to late cropping season in 2015 in Hangzhou (Table 1). Day length and temperature are two key factors of environmental conditions and closely associated with seasonal changes. As for day length, 13.0 h could be considered as the threshold distinguishing SD from LD conditions for rice [22–24]. In the multiple-sowing experiment, the day length increased from 13.3 h at 28 April to 14.1 h at 23 June, and then decreased to 13.0 h at 24 August (Additional file 5: Figure S3). Generally, the duration from panicle initiation to heading in rice stably takes about 28 d [5, 28–30]; that is to say, rice plants flowering before 20 September could experience the transition from vegetative to reproductive phase under LD conditions. Given that, we purposed that all the lines tested in this experiment have completed the phase transition under LD conditions. As for daily mean temperature, a warming trend from early to late cropping seasons was found, despite of obvious fluctuations (Additional file 5: Figure S3). The average temperatures from sowing to heading were 23.6 °C in Trial I, 24.1 °C in Trial II, 24.9 °C in Trial III, 27.1 °C in Trial IV, and 27.7 °C in Trial V. From these observations, we inferred that temperature would be a more critical environmental variable than day length in this test. In all the five trials, the ZS97 homozygous lines always had a late heading as compared to the MY46 homozygous lines. With the postponement of sowing date from Trial I to V, HD of MY46 homozygotes continued to decrease for about 5 d per trial from 76 to 58 d, while that of ZS97 homozygotes was promoted at the same rate in the first three trials but then stabilized at 69 d (Fig. 1a). Two-way ANOVA was conducted to test the heading-date difference between the two genotypic groups of each NIL population. As shown in Table 2, highly significant genotypic effects (P < 0.0001) were detected in both populations in each trial, explaining 54.0–90.4% of the phenotypic variances. Notably, the additive effects of qHd1 were similar among the first three trials and then increased in the last two ones: the averaged effects of ZS97 allele on delaying heading over CJ1 and CJ2 were ranged from 1.4 to 1.8 d in Trial I, II and III, while the effects became 4.0 and 5.7 d in Trial IV and V, respectively. These results support the notion that qHd1 mediated a floral response to temperature variation with the allele from ZS97 conferring a stable heading date at high temperatures. According to the HD distribution curves of ZS97 homozygotes across the five treatments (Fig. 1a), we easily identified the declining trend from Trial I to III and the steady trend from Trial III to V with the turning point in Trial III. Therefore, Trial I, III and IV were selected as the representatives to further analyze the effects of qHd1 on yield traits. Two-way ANOVA was performed to test phenotypic differences of yield traits between the two homozygous genotypic groups of each NIL population, and the results are presented in Table 3. When a significant effect (P < 0.05) was detected, the enhancing alleles were always derived from ZS97 except for the small effects detected on TGW in CJ1 in Trial I and on SF in CJ2 in Trial III. This is in accordance with the understanding that late-maturing allele is generally associated with improving performance of yield traits. In Trial I, significant genotypic effects were detected on NP, TGW and GY, but none of them were consistent across the two NIL populations. In Trial III, yield component traits NGP and TGW, but not NP, showed significant variation in both populations, while the significance of GY variation was just marginal (P = 0.0500 in CJ1 and P = 0.0701 in CJ2). In Trial IV, highly significant and relatively large variation was observed on TGW and GY in both populations, while a small variation with opposite allelic direction was found on SF. Notably, TGW of ZS97 homozygotes were much larger than that of MY46 ones, with the additive effects and R2 averaged as 1.09 g and 74.0% over the two populations, respectively, which were the main sources of variation for GY. Variation of TGW across the three trials was especially noteworthy when it was compared with variation of temperature and HD. As compared to MY46 homozygotes, ZS97 homozygotes greatly increased TGW in Trial IV but not in Trial I and III (Fig. 1b). The average increase over the two populations was 8.8% in Trial IV, whereas differences between the two genotypes were all less than 1% in Trial I and III (Table 3). When considering the increase of temperature with postponed sowing date (Additional file 5: Figure S3), it is reasonable to infer that the qHd1ZS97 allele is favorable for achieving high grain weight at high temperature. When further considering the stable HD of ZS97 homozygotes under high temperature, it is evident that the qHd1ZS97 allele would be advantageous for realizing a higher grain yield through its tolerance to heading date acceleration at high temperatures. NIL sets which included two homozygous genotypes derived from CJ1 differing at qHd1 was examined in the controlled chambers with increasing ambient temperature under SD conditions. As shown in Fig. 2, with the daily mean temperature increase from 22.8 to 24.8 °C, sharp decrease of heading date was observed for both genotypes, i.e., from 114.6 to 76.6 d for ZS97 homozygotes and from 108.7 to 72.2 d for MY46 homozygotes. But when further increase to 26.8 °C, stabilization of HD in ZS97 homozygotes were observed with minor decrease of just 1.4 d, in contrary to the great decrease of 7.3 d in the MY46 homozygotes. Across all the three temperature treatments, highly significant difference in HD (P < 0.0001) was found between the two genotypic groups. These results further indicate the involvement of qHd1 in stabilizing rice heading at high temperatures and possible existence of a thermosensory pathway it mediated. 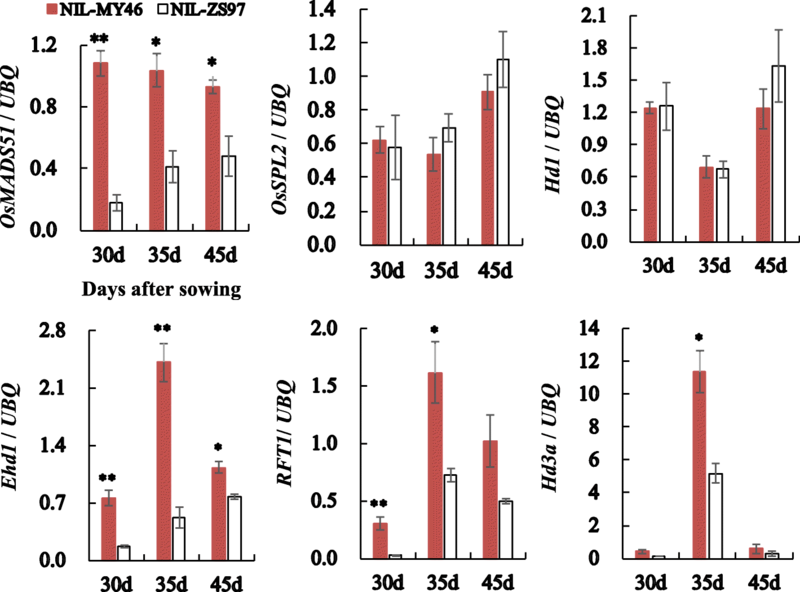 In addition, consistent performance of qHd1 under the SD condition in the phytotron and NLD condition in the paddy field suggests that this thermosensory pathway is independent of day length. The target region contains ten annotated genes (http://rapdb.dna.affrc.go.jp/), including two genes having function related to heading date, i.e., OsMADS51  and OsSPL2 . We sequenced the promoter and entire gene regions of OsMADS51 and OsSPL2 from the two parental lines, ZS97 and MY46. Sequence comparison between ZS97 and MY46 identified no polymorphism in the promoter and exon regions. At the same time, a large insertion of 9.5-kb was detected in the 1st intron of OsMADS51 in ZS97, as compared to MY46 (Fig. 3 and Additional file 6: Figure S4). This result prompted us to examine whether this large structure variation was a functional polymorphism that has an influence on gene expression. Using qRT-PCR, we tested OsMADS51, and four key heading-date regulators, i.e., florigen genes Hd3a and RFT1 and their upstream signal integrators Hd1 and Ehd1 [11, 12]. OsSPL2 was also included, because it is located in the qHd1 region and annotated to be functionally related to heading. The effect of qHd1 on HD became much larger in Trial IV than the three previous trials (Fig. 1a), indicative of the influence of temperature in heading. Therefore Trial IV was chosen for gene expression analysis. Average HD in this trial was 69.3 d for ZS97 homozygotes and 61.4 d for MY46 ones. Gene expression was assessed in 30, 35 and 45-day-old plants grown in the field under NLD conditions, well covering the transition period from vegetative to reproductive phase. As illustrated in Fig. 4, significant changes in the transcript levels between the two genotypic groups were found for the most potential candidate, OsMADS51, and key heading-date regulators Ehd1, RFT1 and Hd3a. Lower expression was found in NIL-ZS97 than NIL-MY46, which is in accordance with late heading in NIL-ZS97. The largest fold changes were found in the first or second sampling time, including 6.2 fold of OsMADS51 in 30 DAS, 4.6 fold of Ehd1 in 35 DAS, 11.3 fold of RFT1 in 30 DAS, and 3.7 fold of Hd3a in 30 DAS. These results suggest that the 9.5-kb sequence structure variation in OsMADS51 could underlie a qHd1-mediated heading response to temperature, by regulating the Ehd1-RFT1/Hd3a expression. In the phytotron experiment under LD conditions, heading date of the NIL-MY46 and NIL-ZS97 were 48.5 and 64.9 d under high daily mean temperature of 31.5 °C, and 70.3 and 78.3 d under low daily mean temperature of 23.5 °C, respectively. 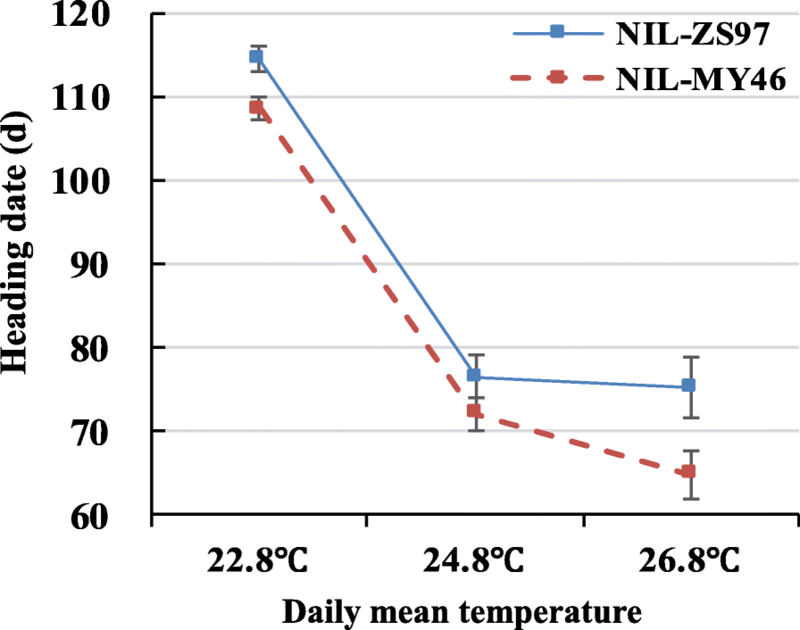 The 16.4 d difference between the two NILs at high temperature was much larger than the value of 8.0 d at low temperature, showing the response of qHd1 to temperature variation. It is also noted that the underlying gene OsMADS51 encoded an MADS-box transcription factor, regulating the expression of genes that are related to metabolism and signaling in response to environmental variations [33, 34]. Therefore, RNA-seq was performed to identify downstream genes involved in qHd1-mediated thermosensory network. Differentially expressed genes (DEGs) between NIL-ZS97 and NIL-MY46 were identified (Additional file 7: Table S3), showing large differences between the two treatments (Fig. 5). Ninety-nine DEGs were detected at high temperature, much fewer than 287 DEGs found at low temperature (Fig. 5a). As compared to NIL-MY46, the numbers of DEGs up- and down-regulated in NIL-ZS97 were 80 and 19 at high temperature, but 68 and 219 at low temperature (Fig. 5b). In addition, for the category of up-regulated genes at high-temperature treatment, seven of the top ten genes showing the largest expression change were found to participate in stress responses, including four genes related to cold conditions (Additional file 8: Table S4). For the remaining three category of DEGs, few of the top ten genes responded to adverse temperature stresses. These results implied that the expression-regulation pattern of qHd1 may be differentiated in response to temperature variation, and further confirm the involvement of qHd1 in thermosensory pathway. Of the DEGs identified, only 14 were commonly found in the two treatments. While OsMADS51, Ehd1 and RFT1 were detected as common DEGs, no other heading-date genes exhibited significant differential expression. Considering that high homology and close linkage between RFT1 and Hd3a may prevent the separate detection of them, Hd3a was subject to qRT-PCR analysis using RNA samples applied for RNA-seq, together with OsMADS51, Ehd1 and RFT1. All the four genes showed significant expression differences as expected (Additional file 9: Figure S5), suggesting a new pathway OsMADS51-Ehd1-RFT1/Hd3a for the regulation of flowering in response to temperature. As described above, the qHd1 allele derived from the early-season indica rice variety ZS97 conferred tolerance to high temperature which is a common environmental stress encountered during the heading and grain-filling period of early-season rice cropping. We therefore decided to test whether the beneficial allele with the 9.5-kb insertion has been commonly utilized in rice production. One-hundred and nine indica rice varieties widely used in China were collected and analyzed (Additional file 3: Table S1). Eleven pairs of PCR primers were used for genotyping of qHd1. Ten pairs extending from 1F/1R to 10F/10R jointly spanned the entire 9.5-kb insertion of the ZS97 allele (Fig. 3 and Additional file 6: Figure S4). Meanwhile, primer pair 1F/10R amplified a 1.0–kb fragment from MY46. Among the 13 early-season indica rice varieties that had large planting areas for a long period before 1985, all except one carried the 9.5-kb insertion. Among the 82 major indica rice varieties used during 1990−2014, the 9.5-kb insertion was identified in 43 of the 48 early-season varieties, but only detected in three of the 24 middle-season and two of the ten late-season varieties. 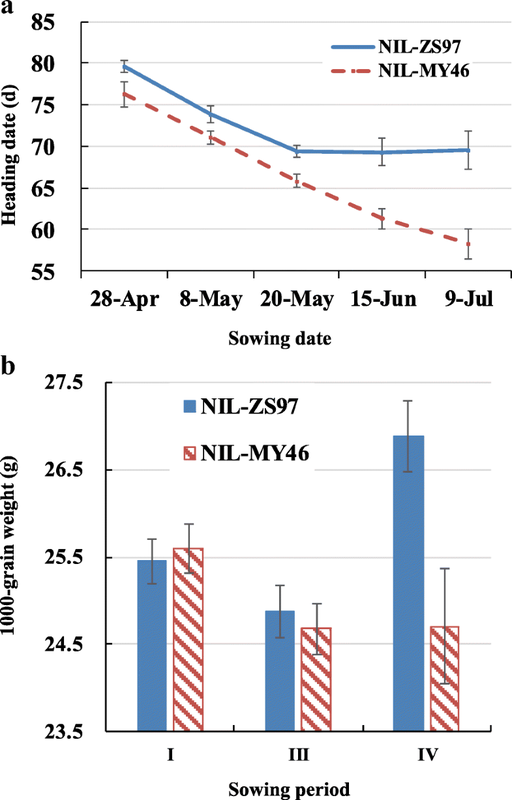 For the 14 early-season indica rice varieties released after 2000, including the backbone parents Jiayu 253 and Zhongxuan 181, and 12 descendants of them, the 9.5-kb insertion was found without exception. These findings indicate that qHd1/OsMADS51 could have undergone intensive artificial selection and play a significant role in the adaptation of early-season indica rice to high temperature at the heading and grain-filling stages. High temperature commonly has negative impacts on rice development and causes yield losses. Rice heading is generally accelerated when temperature increased. The shortened vegetative-growth duration accompanied by limited source build-up is often a severe constraint for attaining a high yield . During the reproductive growth and grain-filling stages, elevated temperature could result in reduced starch accumulation in developing grain because of the declined starch biosynthesis and earlier cessation of assimilate translocation . Identification of genes associated with tolerance to heading date acceleration is of great importance for rice breeding. In the present study, we identified the thermosensory features of qHd1, a minor QTL for heading date that was preciously fine-mapped . Results showed that the allele derived from the early-season indica rice variety ZS97 conferred stable heading date with higher grain weight and grain yield under high temperatures. It was also found that this allele is predominantly shared by early-season indica rice varieties, but few middle- and late-season rice varieties carry this allele. Considering the frequent occurrence of high temperature stress in both the early- and middle-season rice cropping especially in recent years, introgression of the beneficial allele at qHd1 from early-season rice to middle-season rice would be greatly helpful for overcoming yield losses due to heat stresses. Another finding of this study is the OsMADS51-Ehd1-RFT1/Hd3a pathway underlying the qHd1-mediated floral response to temperature. The Ehd1-RFT1/Hd3a pathway downstream of OsMADS51 also functioned as integrators of drought signals . The convergence of heat and drought signal on the heading-date pathway implied the regulatory connection between stress and flowering. As it is well-known, plants generally perceive and integrate various environmental signals to determine the proper timing of phase transition for maximizing reproductive success, either rapidly induce flowering before the stress becomes a great detrimental or temporarily inhibit heading until the stress is over . Consistent with this view, Grain number, plant height and heading date 7 (Ghd7), the major floral repressors upstream of Ehd1 and the two florigen genes in rice , was reported to respond to multiple abiotic stress, including drought, abscisic acid, jasmonic acid, high temperature and low temperature . Likewise, in our results of transcriptome profiling, the OsMADS51/qHd1-mediated expression change was observed for a group of genes that were involved in multiple abiotic and biotic stress-response pathways such as cold, heat, drought, salinity, disease and insect (Additional file 8: Table S4). These results suggest that the heading-date genes/pathway might play a key role in integrating the floral transition and stress response, which would provide new leads for exploring the intricate genetic networks. Day length and temperature are two key environmental factors associated with seasonal changes and strongly affect the crop duration and grain yield of rice. Recent studies have revealed that heading-date genes could possessed pleiotropism for yield traits, and their natural variations have been used in rice breeding mainly with the late-maturing allele enhancing grain yield, such as Ghd7 , Days to heading 8/Grain number, plant height and heading date 8 [41, 42], Hd1 , Grain number, plant height and heading date 7.1 /Days to heading 7 [44, 45], and RFT1 . These reports focus on the pleiotropism for yield traits in response to photoperiodic changes, and none of them work on the response to temperature variation. In the multiple sowing-date experiment of this study, we noted the pleiotropism of OsMADS51/qHd1 varied greatly in response to temperature change (Table 3). Variation in grain yield might be derived from both NGP and TGW (Trial III) or mainly from TGW (Trial IV). The magnitude of genotypic effects on yield traits also varied greatly, showing an association of stronger effects with increased daily-mean temperature (Additional file 5: Figure S3). This finding was consistent with the reports that a slight temperature change of 1–2 °C would have dramatic effects on grain yield and its components [2, 3, 47]. OsMADS51, the gene underlying qHd1, was previously isolated by T-DNA insertion and reported to be photoperiod sensitive, influencing heading date under SD conditions only . However, this gene also showed contribution to heading-date variation under LD conditions in this study. These suggest that OsMADS51 could affect heading under both under the SD and LD conditions, but the function may change depending on the genetic backgrounds. For the temperature responsive function of OsMADS51, no similar result has been reported for heading date genes in rice. Nevertheless, it is noted that OsMADS51 encodes a MADS-domain transcription factor, and several key components such as SHORT VEGETATIVE PHASE , FLOWERING LOCUS M , FLOWERING LOCUS C and MADS AFFECTING FLOWERING 2, 3, 4 and 5  in the Arabidopsis flowering-regulatory thermosensory pathway also belong to the MADS-box transcription factor family. This is in support of the inference that OsMADS51 mediates the floral response to temperature variation in rice. Our work identified the genetic contribution of qHd1 to temperature responses in rice, showing that this QTL regulates heading date in association with high-temperature tolerance at the heading and grain-filling stages. The underlying floral pathway OsMADS51-Ehd1-Hd3a/RFT1 was found, in which OsMADS51 is the gene for QTL qHd1. The beneficial allele of OsMADS51 has become predominant in early-season indica rice varieties but remains rare in the middle- and late-season ones. This indicates the great importance of qHd1 for the adaptation of early-season indica rice to high temperature during the yield-forming process. The information provides new leads for a molecular understanding of how temperature influences rice growth and then affects rice production. We thank the National Medium Rice Genebank at the China National Rice Research Institute for providing rice accessions. This work was supported by grants from the National Natural Science Foundation of China (31701398, 31371605) and the Chinese 863 Program (2014AA10A604–15). RNA-seq data are available from the Short Read Archive under accession number SRP115036. Any other datasets used and/or analyzed during the current study available from the corresponding author on reasonable request. JYZ designed the experiments. JYZ and LYM selected the rice materials. JYC performed most of the experiments. HWZ, HLZ and LYM performed some of the phenotyping in the field. JZY performed some of the phenotyping in the phytotron. JYC and JYZ analyzed the data and wrote the paper. All authors have read and approved this manuscript.